Hi Guys, just have to share our little Road Trip to the Chiang Mai YEE PENG or Yi Peng Floating Lantern Festival with you all. You might have heard about it, its so much fun. It’s just one of those thing you have to do once in your life. Checking our favourite forum we discovered that tomorrow 400km away there would be the Yee Peng Festival of Floating Hot Air Lanterns. 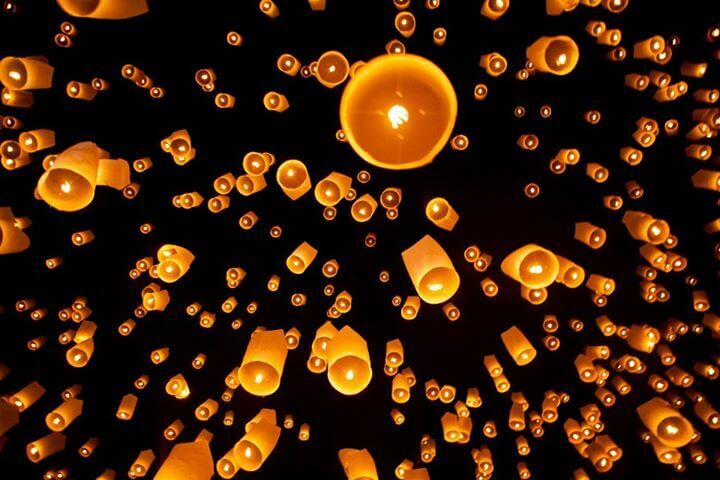 Over 10,000 lanterns would be released in unison as part of a Buddhist Ceremony to mark the 2nd Full Moon of the Year. We had heard about this magical event and knew it was time to pack our bags and experience this wondrous event ourselves. We quickly jumped on Agoda to book a hotel, and found a 4 star luxury Golf Club resort only 2km from the Lantern Festival. The Mae Jo Golf Resort, sounded great on the web, and with Agoda we got a great price only US $50 a night including a cooked buffet breakfast. Camera charged and bags quickly packed, we set out alarm and tried to get some rest before tomorrow’s excitement. BEEP BEEP BEEP, it was soon time to wake up and hit the road. Hugs goodbye to mom car windows quickly washed, the Road Trip begins. 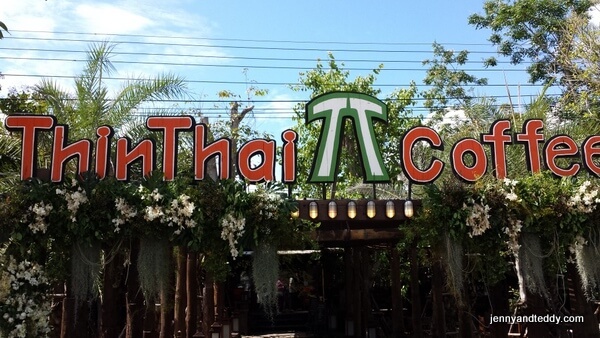 Traveling in Thailand can be just as much fun as reaching the destination. Along the long highways you find the most interesting Pit Stops. And the variety of exotic souvenirs, food and drinks available for pocket change always amaze me. 100km south of Chiang Mai busting for a powder room we pull in at “Thin Thai” a mix of traditional carved wood and modern glass construction with shaded tables under a thatched grass roof. Such a beautiful place in the middle of a Tropical Jungle. A quick look the and yummy menu has our order placed and we head off on another mini adventure (just to find the powder room) down the long path we are entertained by native singing birds and enticed to gaze in amazement at the 1cm long Fire ant colony building their own tree house. Nose fully powdered and happy tummies stretching our belts its back in the car for the last 100km to Chiang Mai. Parked safely with the smartly dressed security guard on patrol, we jump into the waiting electric golf cart to be delivered to our beautiful room. Greeted by a bowl of fresh tropical fruit and the most amazing view overlooking a lake with avid golfers chipping in the distance. 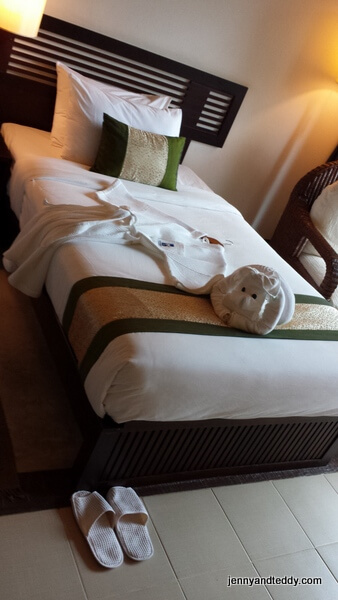 Delighted with our selection we enjoy the comfort and luxury we have been dreaming about. Walking around the resort grounds we delight in the sights and sounds of native wildlife and beautiful manicured gardens. Racing back to the room, we hurriedly slip into our swim suits and race back to the Resorts Giant Swimming Pool. A quick splash around leaves us feeling refreshed and ready for the nights activities. The poolside barman advised us there is a free transport van to the Festival. Cameras ready we drive out of the Golf Resort and through a tiny Thai village that is preparing their own celebrations there are Hot Air Floating Lanterns and Water Floating flower arrangements called “Kratong” with candles and sweet smelling scented incense. A little look around their market for a few souvenir’s and tasty snacks and it’s onto to the major event. We arrive just in time to reserve our place of honour. We are surrounded by over 10,000 people, with many international faces here to share the event. Buddhist monks with shaved heads wearing traditional saffron colours robes lead the procession as enticing unfamiliar musical instruments serenade us with calming relaxing music. 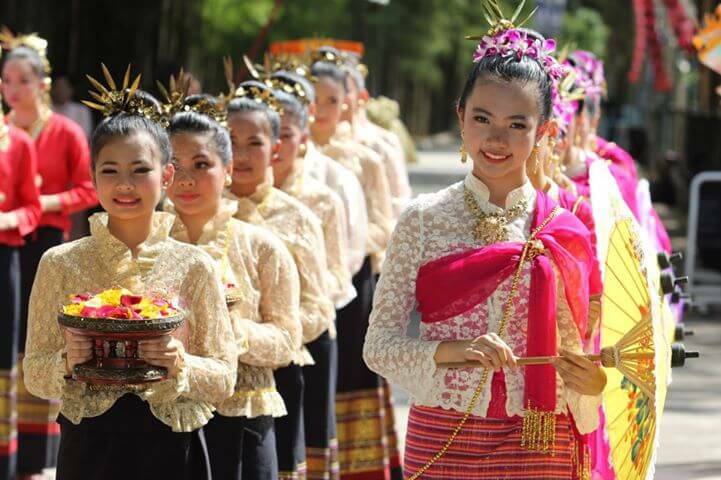 Local Thai people wearing the most beautiful hand woven silk and cotton traditional formal dress great us and take us to the Lantern release point and explain the tradition and meanings behind the simple actions we will perform. Monks chant and music pauses as the time to light our giant candle pole arrives. We open out Giant Floating Lantern and fill it with air, holding it over the candle pole to warm up. The on board fuel is lit and we countdown to the release. Time is frozen as 10,000 Burning Floating Lanterns slowly rise to light up the night sky with the most beautiful sight. 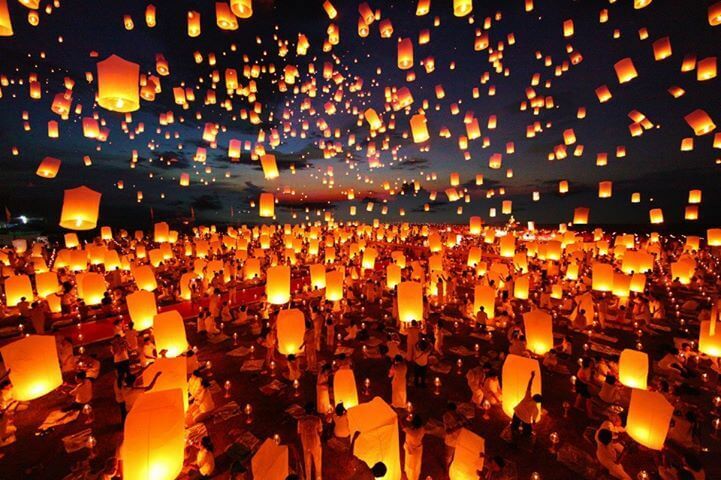 Higher and higher the Lanterns rise the looks on the crowds’ faces showing a mix of excitement awe and calmness. It’s one of those experiences that’s hard to put in words. You simply must add this to your calendar and come to experience for yourself the beauty and Traditional Culture of Thailand Yee Peng Floating Lantern Festival. That’s so amazing! It sounds like a wonderful, spontaneous adventure for you. I’d love to experience the Yee Peng festival once! Thanks for sharing! Hi Lilly, Yes it was truely amazing, so many local and international peoples together to share a beautiful ceremony of kind thoughts. Atmosphere so different from a rock concert. we left feeling like we were floating on air ourselves.